This entry was posted on Friday, March 17th, 2017 at 7:09 pm. As a lifelong equestrian, I have been around Jack Russells for years. There was always one or two at the barns at which I rode, running around wildly and just being generally adorable. I always knew I would own one; I even had the name picked out and ready to go – Mint Julep. I just needed the dog. My husband and I have only had German Shepherds, so neither of us have ever owned a small-breed dog. On my 34th birthday, that would change. Birthdays will do that to you. You start thinking about the year ahead, your goals and hopes…and then the next thing you know, you’re on www.majr.org searching for dogs to adopt! The only requirement that I had was that my new dog be cat-friendly as I have two older persnickety felines that I needed to keep safe. One Facebook message later and I learned that MAJR would be at the Darlington Apple Festival the following day. I was planning on attending anyway, so I made a note to stop by their booth. The next day was cool and cloudy, and the threat of rain was promising, (it ended up pouring)! I debated skipping the event altogether, but my sister insisted – and I’m so happy she did! At the MAJR booth, I spoke with Juanita, who talked about some of the dogs available and the overall adoption process. I then looked over and saw the cutest pup dressed in a shark costume, sitting contentedly on a lady’s lap. “Who’s the shark?” I asked. I walked over and met Eva’s foster mom, the amazing Marie Stonebraker, and learned all about adorable little Eva. Her backstory was so sad. 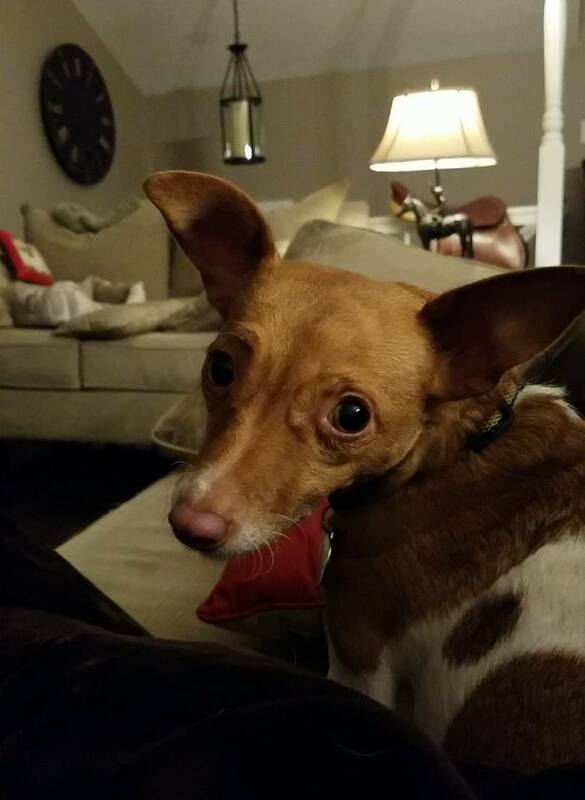 Eva was found (with her puppy) wandering the woods of Southern Virginia. They were taken to a shelter where her puppy (whose name is Toby!) was immediately adopted. A shelter volunteer, Tonia Johnson, took a liking to Eva, saw her potential, and contacted MAJR. Not long after, Eva made her way to Marie’s home in Delaware. This was in June of 2016. Marie worked with Eva for months, and eventually she deemed her little rescue fit for adoption. When I met Eva at the Apple Festival, she allowed me to pet her, but I could tell she was timid and would need lots of time to adjust. After speaking in-depth with Marie, I knew that Eva would be a perfect fit for my house and lifestyle. My husband and I both work from home, don’t have any children, and had plenty of time to devote to this little girl. On October 9th, Eva got a new home – and a new name! Mint Julep (aka Julep or Juju) found her forever home. She was so nervous that she wouldn’t allow me to pick her up, nor would she walk on a leash. Taking her out to go to the bathroom was difficult to say the least! But my husband and I took our time with her, gave her space, and let her decide when she was ready for the next step. She needed lots of patience and positive encouragement. Within two days, however, she was asking to snuggle on the couch with me. Within a week, I was carrying her around the house like a little baby doll. Now, five months later, Julep is completely settled into our home! She still has off-days where she’s a bit skittish around my husband, and she’s wary of strangers, but she’s Queen Julep and rules the roost! She enjoys stealing and hording toys to build her Toy Empire, taking walks around our farm, and cuddling in bed. She’s a huge fan of our heated mattress pad and burrows down under the comforter! Every day I tell Julep that she’s “the love of my life.” She just wants to love and be loved. My mom, (who adores her “grand-dog” and has threatened to steal her from me), says Julep “is a special little soul.” I couldn’t agree more and can’t believe I waited this long to rescue a Jack Russell. But now I’m hooked for life.